Are Individual Disability Insurance Benefits Taxable? No. Individual Disability Insurance Benefits are not considered taxable so long as you are paying for your premiums with after tax dollars. Can I Pay The Premiums Through My Practice? Yes. Most accountants will add your premium amount to your income at the end of the year so that your benefits remain tax-free. Am I Still Covered If I Leave the Country? It is possible to remain covered if you move outside of the United States. Most carriers require you to remain under the care of a United States Physician unless you are deemed permanently disabled and no longer need to remain under the care of a physician. Who Determines If I’m Disabled? You and Your Doctor will determine if you are disabled and unable to work in your specialty. All insurance carriers reserve the right for a second opinion of they feel one is necessary. Does My Policy Change If I change Jobs or Specialties? No. If you own a individual disability insurance policy with Non-Cancelable and Guaranteed Renewable clause then the insurance carrier can never change anything regardless of your new field. Your occupation is determined by whatever your specialty was at the time disability began. What waiting period do most physicians choose? Most of our clients choose a 90 day wait. What Is Business Overhead Insurance? This is used if you are a business owner and are responsible for a heavy overhead expense every month. Having a Business Overhead policy protects your business if you are disabled so that you are not forced to pay from your own pocket to keep your business operating during your absence just so you have a place to come back to when you recover from your disability. How Do I Determine If I need Business Overhead Insurance? Simple. Ask yourself if you can afford to keep your practice running if you were to miss more than 30 days of work without income coming in. As it pertains to Own Specialty Coverage. Residual benefits are also know as partial disability benefits. In the event that you become partially disabled, residual benefits will pay you a pro-rated benefit amount if you are still working in your field. Complications of pregnancy are covered unless your underwriter excluded them prior to you purchasing your policy. However, maternity leave is not considered a covered disability by any carrier. What Are The Most Common Pre-Existing Exclusions? Can I Still Buy Coverage If I Have Existing Coverage? This will depend on what pre-existing conditions you have. Most minor well controlled pre-existing conditions will not stop you from being able to purchase a disability policy. Depending on your medical history some policies are offered with exclusions, ratings, or limited benefit periods to protect the insurance company from a existing condition. Only speaking with your agent and completing your medical underwriting can determine your own personal situation. What Do I Need To Do In Order To Apply For Coverage? Complete an Application. This usually takes about 7-10 minutes with your Doctor Disability Shop Agent. Schedule a short 20 minute medical exam. Complete a Phone Interview. If you are applying for over 5,000 a month of total monthly benefit then the insurance carrier will request that you complete a phone interview. Provide income documentation. If you are applying for over 10,000 of benefit the insurance carrier requests 2 years of your most recently filed tax returns with all schedules along with 2 years of your practice returns if you are self-employed and file a separate return. If you are applying for 10,000 or less the insurance carrier will request a pay stub, W-2, or your most recently filed tax return. However, if you are a business owner, you must supply the insurance carrier with your tax return and business return for the last year. My Medical Association is Offering The Same Benefit, But Cheaper. Why? Because your Medical Association is not offering true own specialty coverage. See our about disability link to read about the difference between the available definitions of disability insurance. Your medical association plan is also not guaranteed. The rates will likely increase and the policy can be canceled or changed by the insurance carrier at any time. You will likely end up spending more with your Medical Association policy after all your rate increases. There are also many other reasons why. Please contact us to find out more. If My Employer Provides Me With Group Coverage, Why Do I Need to Buy My Own Policy? Depending on how much group you have and what your current income is you should consider purchasing your own individual policy. Individual policies are not taxable. Most group plans are taxable. Most Group Plans are not considered to have a true definition of “Own Specialty”. Check out our about disability link to see the difference between the available definitions of disability. Group Plans are also not guaranteed. They can be cancelled, rates can increase, and they might not be portable. How long does the medical exam take? A licensed nurse or doctor. They will contact you to arrange a mutual convenient time to meet you at your place of choosing. What Do They Do During The Exam? Depending on the benefit amount you are applying for an EKG might be needed. They draw blood, take urine, and repeat the medical questions that you went over with your agent when you completed your application. They will also weigh you, take your blood pressure, and pulse. What Should I Have With Me For My Exam? Your Drivers license or government issued I.D. The Names of all your medications and be prepared to provide the examiner with a brief description of why you take these medications and what your pre-existing health issues are. Please also be prepared with the name, address, and contact phone number for your physicians. Does My Existing Group Policy Limit My Ability to Purchase Good Individual Own Specialty Coverage? Depending on how much group coverage you have and what your Adjusted Gross Income is, yes. Group Coverage might limit how much individual coverage you are allowed to purchase. What Separates Doctor Disability Shop From My Other Options? We know doctors. We only work with you. We have exclusive discounts for disability insurance benefits. You will save between 15-20% per year by utilizing the discounted programs that we have helped establish. We work with every available insurance carrier and we know everything there is to know about protecting a doctor’s financial well being. We offer expedited and simple underwriting methods that guarantee to get your policy approved faster then anyone else. We work with the top underwriters and have direct relationships with them. This means you can rest assured that you are not just a number to your underwriter. We have spoken with him/her directly and informed him of your personal situation. Nobody will get a better rate, we will use every means possible to negotiate the best offer on your behalf. We are a true product of underwriting. 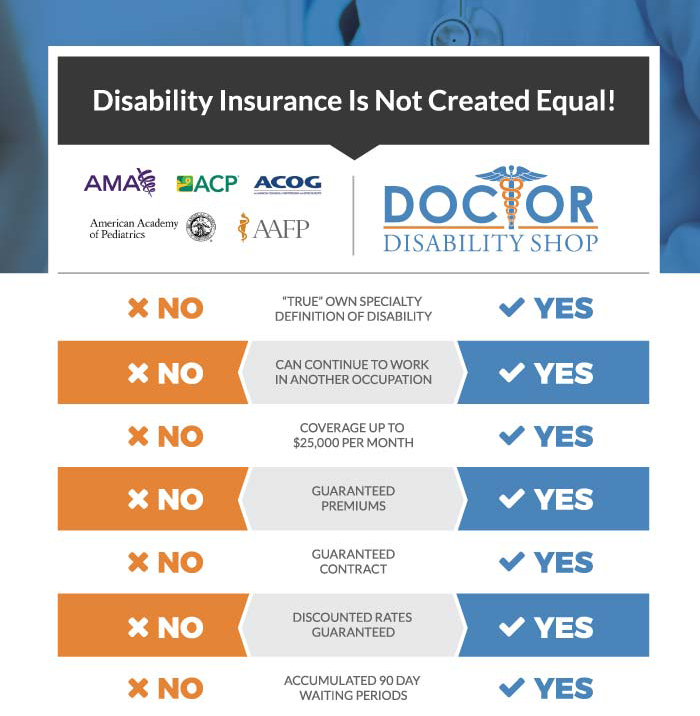 Once I Purchase A Policy From Doctor Disability Shop, Will I Ever Hear From You Again? Yes. We keep in touch. We ask that you follow our website and social media links to keep up to beat with what’s going on in the insurance field as it relates to physicians. We will contact you to review all Future Purchase options and Automatic Increase options on a yearly basis. Why Am I Eligible For A Discount? Because the Doctor Disability Shop Has established a discount at one of the facilities or associations that you are affiliated with. Because Your Rates Are Discounted, Am I Losing Anything Compared To A Contract Without a Discount? No. It’s the same exact benefit. Just less expensive because of certain Hospital, Association, or business affiliations you have.